A proposed 250 unit townhouse development was underlain by old fill materials to a depth of approximately 18 feet. The fill consisted of silty sand, clay and construction rubble. The depth to the water table was in excess of 15 feet. Excavation and replacement of the old fill material was estimated to be approximately four times the cost of dynamic compaction. Therefore dynamic compaction was selected to improve the subsurface conditions. Dynamic compaction was performed with an 8 ton weight falling from heights of 60 feet. 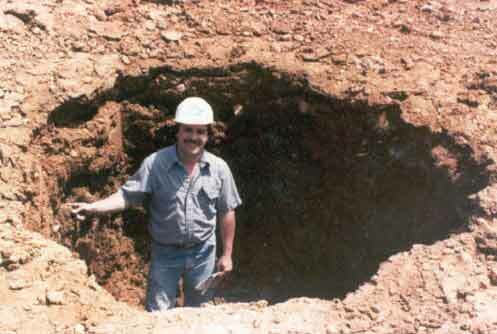 Due to the poor quality of the fill material, the craters, which averaged about 5 feet deep, were backfilled with select granular fill. The site was lowered by an equivalent depth of 1.5 feet during the compaction operations, corresponding to nearly 10 percent strain. Geotechnical testing following completion of the dynamic compaction operations indicated an allowable bearing pressure of 2 ksf was achieved by dynamic compaction.